I am currently working on a pretty elaborate article related to the UK-Pakistan terror path, (i.e. 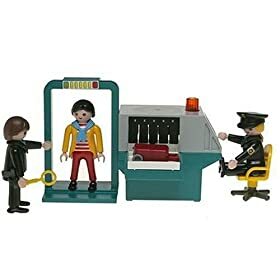 requiring me to use more than two sources, none of which include the beloved Wikipedia), but a friend sent me this Amazon product link that I thought made a pretty hilarious buffer post, particularly given how the war on terror has impacted many of our experiences at international airport security. Being a Muslim from Pakistan definitely makes for some interesting and lengthy encounters with immigration, to say the least. Just the kind of toy that makes me warm & fuzzy about what we teach our children nowadays – don’t you agree? DISCLAIMER: The aforementioned product is not a real vendor – hence, this post is all in good fun, meant for comic relief. The reviews – at least I hope – are also concocted for humor purposes. Thank you! Let’s remember that the people we are fighting today, we funded 20 years ago. And we did it because we were locked in this struggle with the Soviet Union…and we went to work. Obviously, we cannot change the past – but an acknowledgment from Washington about the part they played in the problem is still pretty cathartic. What do you think? Q: What do you think has been the biggest mistake the Pakistani military has made when dealing with the tribal areas? First, it was the inability to address the grievances of the people. There’s always upset people in any society and if they have grievances, they act as a tool for the militants who come and organize communities around discontent. I think allowing simmering grievances to remain in an area has been a mistake, which is not the military’s fault but the state’s fault. As far as the military is concerned, I think the biggest problem is that we don’t have a counterinsurgency strategy – which is a holistic approach to the problem, not a military one. We have been too reliant on the use of force and that has led to a lot of collateral deaths, which has again aggravated and increased the grievances. Because the military operates in an honor society, people who have had their kin killed, then come out and taken revenge for those deaths. It has led to an increase in suicide bombers, which was an unknown phenomenon amongst the Pashtuns, but now it has become part of the protest, part of the model. The third failure is not strengthening the state, because when you negotiate with the militants you tend to reduce the effectiveness of the state and the people’s respect for it. One has to be very careful – if any peace agreements are going to be done, the government has to do it from a position of strength and not of weakness. Q: Given the negative news of late, people have felt pessimistic about the current security situation in Pakistan. Do you feel the mistakes the military and government have made can be rectified for the future? I think what happened in Pakistan on the 15th of March when the whole nation stood as one for the reinstatement of the chief justice should act as an example. My own feeling is that the situation is not hopeless but we are a divided house. We all have to act together – the politicians the military and the civil society – and once we build up this momentum, we’d be in a much better place. And that would be the best response to the militants, and it would also strengthen the state forces who are fighting them, give them the moral edge, and give more legitimacy to deal with the insurgency. We should invest more time and effort in trying to mobilize our society against the insurgency. Q: If it has been long known that we have needed to fight these militants using a proper counterinsurgency strategy, what are the obstacles that have prevented us from enacting it sooner? By not having a COIN [Counterinsurgency] strategy we have created a confused response by the state security apparatus. Let me explain this by an example. Four days ago a police party was leading a convoy of Frontier Constabulary soldiers which is a paramilitary force into Buner. In a situation where there are militants opposing such a movement, which was the case in this example, precautions through the use of advance reconnaissance or the use of helicopters is normally undertaken. This was not done. The police party was attacked by militants and the policemen were killed. The movement of troops was stopped. Failure such as this could be prevented if there had been a detailed COIN strategy that outlined standard operating procedures in such cases. As in other cases, we lack the political will to do the right thing and thus we are adrift and losing ground to the militants. Q: In Iraq, the U.S. would distinguish among insurgents by referring to some as “reconcilable” militants versus those who are “irreconcilable.” In the case of Pakistan, is it important to make that similar distinction – and, more specifically in the case of the Sufi Muhammad and the TNSM, should we continue to negotiate with them? Negotiations can only succeed if the state is in the more dominant position. In Swat, we negotiated from a position of weakness and therefore I feel that the agreement will turn out to be an embarrassment. Militancy has to be tackled through a multidimensional approach which is absent. Q: What is your opinion on the increased U.S. drone strikes in the region? Q: Moving to the more human aspect of the conflict – there are currently 80,000 Internally Displaced Persons living in camps in Pakistan, and more than 700,000 throughout the country – what services are being provided to these people? Can the government do more? Various Pakistani agencies, international organizations and NGOs are busy in providing different services in the field of health, education, water supply and drainage etc to the IDPs. However, there is a shortage of funds. Funds are available only till May. If more money is not made available soon the crisis of the IDPs will deepen, causing more grievances. Q: Last but not least, do you see the glass as half empty or half full? The limited response set off fresh scrutiny of Pakistan’s military, a force with 500,000 soldiers and a similar number of reservists. The army receives $1 billion in American military aid each year but has repeatedly declined to confront the Taliban-led insurgency…The military remains fixated on training and deploying its soldiers to fight the country’s archenemy, India. It remains ill equipped for counterinsurgency, analysts say, and top officers are deeply reluctant to be pressed into action against insurgents who enjoy family, ethnic and religious ties with many Pakistanis. Some analysts suggest the government is biding its time, waiting for the Islamists to over-reach – and that when it is plain to the public that they cannot be trusted or reasoned with, Islamabad will send the army to crush them. But others detect a lack of political will, a deep-set ambiguity about confronting groups that have served Pakistan’s purposes in the past in Afghanistan and Kashmir, and also, perhaps, a failure of nerve. But the outrage will prove momentary, the consensus fleeting if the people’s representatives don’t rise to the occasion. There are a few promising signs, with the PML-N and the religious parties joining the MQM in expressing their reservations about what was agreed to in Swat…But desperately as we do need a public consensus against militancy that is not what is ultimately going to defeat the militants. To defeat the militants, the state, particularly the security establishment, must be on board. The military made an effort to indicate its resolve in the face of criticism, when COAS [Chief of Army Staff] Gen. Ashfaq Kayani told an operational meeting today that the Army was committed to preserving the safety and well-being of Pakistan’s people, adding, “The operational pause, meant to give the reconciliatory forces a chance, must not be taken for a concession to the militants.” According to Dawn, “It was the most direct statement by General Kayani, or any other security or civilian official, about the prevailing situation and the manner in which it needs to be tackled.” While we must wait and see whether these statements translate into formative action, the next 48 hours will be crucial, particularly because sources say the military operation in Swat will soon be underway. A friend asked me this morning as I was formulating my thoughts whether or not we should be truly scared. And I would say yes. 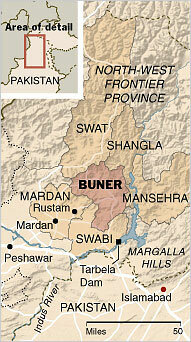 Here’s the thing – the Taliban may have withdrawn from Buner, but the fact remains that they were able to consolidate power there in the first place. These militants aren’t just waving their scary guns from the frontier, they were 70 miles from Islamabad, my hometown. Their influence has pervaded Karachi, one of Pakistan’s main cities. They have perpetrated attacks on the relatively untouched Lahore. They have the ability to not just come at us from the north, but enclose upon us from all directions. The threat is very real and it’s very near. It is dangerous because they present a united front. The reason why hope is not lost, therefore, is because Pakistan – the state, the military, and the civil society – are finally beginning to be on the same page. A successful strategy against the Taliban cannot work without all three actors – the military needs the public consensus behind it, not only to marginalize support for the militants but to bolster its own moral resolve. The public needs both the government and the military to enact a unified strategy and restore security. And finally, the government needs to restore the people’s faith in the state. While I am not a politician or an army general, I am a citizen. And as a Pakistani, the only way to save ourselves is if we do more than just sit on the sidelines. Take notes from the citizens of Budaber, who have established neighborhood patrols to fend off the Taliban. If you don’t want to be out on the street, voice your protest by attending rallies or circulating petitions telling the government to wake up. But for God’s sake and our country’s sake, do something. Appeasement is, to put it mildly, a naïve policy denoting weakness. It is a yielding of compromise and sacrificial offerings. More bluntly, it is moral cowardice exhibited by pathetic men and women who offer concessions at the expense of others. Appeasement is doing deals with men who have insatiable territorial appetites with the wish to impose their own brand of false theological practices and beliefs. Although columnist and MP Ayaz Amir spoke out in the Parliament against the Regulation, what is shocking is that every female parliamentarian stayed silent, despite the countless bombings of girls’ schools, despite the circulation of a cell phone video showing the Taliban flogging a young girl in Swat. Every silent MP who stood in support of the Nizam-e-Adl manifest the horrific state of denial we live in. Yes, the ambiguity of the Regulation allows room for manipulation of the law – but to act as silent bystanders through it all is almost as bad. While these are a depressing run-down of developments, it should nevertheless be a frightening reminder that this threat is no longer in Pakistan’s periphery – it’s on our doorstep. As Cowasjee noted in his article’s footnote, “Karachi is already feeling the Taliban pinch. Co- educational schools in Defence, Clifton and Saddar areas are known to have received visits and been threatened if they do not change, others have been sent letters with the same message.” Given that Sharmeen Obaid-Chinoy, in her PBS Frontline film “Children of Taliban,” also reported on the militants’ increased presence in Karachi, we should know better than to be in denial any longer.